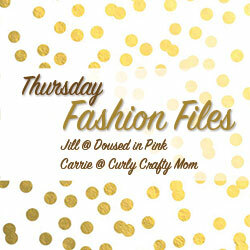 It's been quite awhile since I did a Fashion Friday post! Today's edition is all about simple outfits I've been enjoying that are more than just jeans and a t-shirt. Just because I'm at home with the kids all day doesn't mean that I don't like to look nice! Plus, if I get up and get dressed first thing, I'm more likely to get more things done. Here's an outfit I wore on our field trip to the Children's Museum and then to Bible Study on Tuesday - simple, easy, and cute! Here's another look, featuring one of my favorite sweaters. I don't have the boots and the necklace idea I borrowed from a friend but otherwise, this is another staple outfit. Ok, I've had lots of blacks & greys - because I do wear them a lot - so here's an outfit with some more color. I have several of these maxi skirts from PinkBlush - they are SOOOO comfy! Let me know what you think in the comments - and feel free to share your favorites or go-to items!